By Dr. I. Elizabeth Borgmann. We have already talked about lameness involving trauma to the feet. In this article we will discuss lameness to the other aspect of the limbs. What does it mean when your dog is suddenly lame? And how quickly do you need to respond? The limbs are really quite simple structures. And in their simplicity, they are quite amazing. The bones provide the foundation. The muscles shorten or elongate to allow the limbs to move. Tendons and ligaments hold the bones and muscles in place. Nerves tell them what to do. Really, it’s pretty simple. But the simplest of systems are often the most amazing! Let’s explain further how the limbs work. Bones are the solid foundation of the system. Bones are held together by ligaments. These keep everything in alignment. Tear a ligament, and the alignment is disrupted. The most common ligament injury we see is the torn cranial cruciate ligament of the back legs (it is equivalent to the ACL or anterior cruciate ligament tear in the knees of people). Muscles lie outside of the bones. With the right mixture of contraction and relaxation you have movement. Just like you, your pet can pull or damage a muscle from overuse when it is unconditioned or overworked. The muscles are attached to bone by tendons. If you tear a tendon or muscle off the bone, there will be marked muscle shortening and you will see this. The most debilitating and painful tendon tear is that of the Achilles tendon. Fortunately, it is a rare occurrence (unlike people). The nerves communicate with the brain so you have coordinated movement. Damage to nerves means the muscles cannot contract and relax properly to allow movement. Damage can occur at the level of the brain, spine or peripheral nerves. Without this communication system, the limbs cannot function. So what first aid issues may you run into? These articles emphasize first aid – things that go wrong suddenly that require attention. We do not have the scope in these articles to discuss the slow degeneration of any of the parts that allow the limbs to work. We will focus on the rapid and sudden damage that occurs secondary to traumatic events. It comes down to three possibilities. Limbs can be fractured. Ligaments and tendons can tear. Nerves and muscles can be damaged. In the true sense of emergencies (life threatening) – most of these are not emergencies. But they can all result in serious long term damage if they are not dealt with in a reasonable amount of time. Of all of these, the most important to deal with quickly is nerve damage so we will discuss this one first. Nerve damage is the scariest problem. Nerve damage is not always reversible and nerve damage is often a bit vague. If your dog or cat is having problems with spinal nerve compression they won’t go up or, more commonly, down the stairs. They may drag their toe nails. They won’t jump up. They cry when you pick them up. This is a problem that needs to be seen quickly to minimize the long term damage. Don’t wait until the problem becomes an acute exacerbation – when all of a sudden they can’t move and feel their legs. Then this turns into a true emergency. It you are out walking or hiking when this happens, you can place sticks on either side of the spine and wrap these in place with vet wrap, or even your extra sweaters and jackets. This provides some spinal stabilization while you carry them out of the woods. Try to keep the spine straight when lifting them by sliding one arm behind the rump, between the legs and forward to the chest to provide a fairly straight support of the spine. If you scoop them up, as most of us do, you will flex the spine. I mentioned above that an absence of pain makes this an emergency. So…how do you tell if they can’t feel their legs? If you pinch a toe and your pet responds by looking at you or yelping, pain perception (and the nerve function) is adequately present. (A withdrawal reflex does not indicate pain perception. This is part of what we call a reflex arc.). As long as pain perception is present, we can manage nerve damage. If pain perception is gone, we need to intervene more quickly. If neck or back injury has occurred, stabilize the back and carry your dog out and into a vet office quickly as described above. We are not discussing toxicities in this article, but this is a good point to remind you that toxicities can make a pet look uncoordinated. This is not a musculoskeletal issue. And it is an emergency that needs to be seen by a vet. If a limb is broken, it is usually due to a traumatic event and you will have a reasonable suspicion of its occurrence. Your dog fell down a shale slope while hiking, was hit by a car, or you stepped on its foot. If the limb is obviously broken, you want to prevent or minimize any further movement of that limb. The pain, and subsequent damage, comes from the free movement of the broken parts. A thick padded bandage works well. If you are out hiking, using your down vest works great as padding for the leg. You can gently tighten another bandage around this vest to provide compression without compromising circulation. You need to bandage above and below the joint involved – not just over the fracture site. Watch the toes. If they are cold, or swollen, your bandage is too tight. What if the fracture involves the femur or the humerus (the large bones where you cannot bandage above and below the fracture site? In these cases, a sling may work best. Dogs are lucky – they have 4 limbs. They carry 30% of their weight on each front limb and 20% of their weight on each hind limb. They can manage remarkably well on 3 legs. Slinging the leg will minimize movement of the fracture site. If a ligament or tendon tear occurred, you pet was probably active. Most commonly, they are running after a Frisbee or a ball, let out a squeal and then come back to you three-legged lame. Or they were chasing the cat and placed significant force on the back legs as they went around that corner of the house. Dogs will commonly sprain the carpus (wrist), tear a cruciate ligament, or tear the ligaments holding the knee cap in place. If they have damaged a ligament or tendon, you will be hard pressed to find the source of the problem. Everything will feel stable to you (there are tricks) and they won’t necessarily yelp in pain…but they are lame. These situations do not need to be splinted or slung. 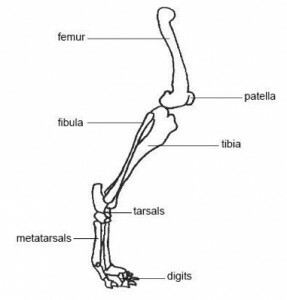 They will walk out on three legs and may even use the injured leg to stabilize themselves when standing (toe touching). The leg is unstable and therefore can’t support their weight but it is not as painful as a fracture. Serious muscle trauma occurs less frequently, but also usually happens after significant activity. It is more common to see muscle soreness that appears a few hours later, much as it does with us. Rest and time usually resolves the issue. So, to summarize and emphasize: bone, muscle, ligament or tendon damage can wait. Nerve damage needs to be attended to quickly. So…what do you need to pack in your first aid kit when hiking those hills or driving to the dog park? You need something soft (one of your vests or jackets will do) or rolls of cotton or soft wrap and you need bandaging material – preferably 2 and/or 4 inch wide gauze rolls and 2 or 4 inch wide vet wrap or equivalent. If you need a splint, you can make one out of pretty much anything (the nearest stick will work). If you are a truly serious hiker, you probably have one of those collapsible light weight aluminum splints in your first aid kit already. Creativity is what will help you here. As a reminder, there are other issues that can result in apparent lameness. We already mentioned toxicities. Hypoglycemia, most commonly seen in driven working dogs, is a possibility. As well, some breeds have genetic disorders (eg. exercise induced collapse in Labrador Retrievers) predisposing them to conditions that may be confused with lameness. These are out of the scope of today’s discussion – but do keep them tucked in the back of your mind. The next step is to call your vet for advice (this is an important number to have programmed into your cell phone). Depending on what you tell them, they may want you to come in immediately or they may schedule you for the next day. As mentioned, most orthopedic injuries are not medical emergencies because they are not life threatening. Granted, it is hard to watch your pet suffer and wait for attention. Most vet hospitals are very attuned to that – but unfortunately you may get bumped for that caesarean or that ruptured bleeding abdominal tumour. And finally – do not give them any pain medications without speaking to the vet office first. Some pain medications are not compatible with others and require a withdrawal time before another is started. That was a lot of information for one article and we only touched upon the common issues. Next time, we will discuss toxicities, since we touched upon them here.